How long has RTA been serving the industry? The Railway Tie Association predecessor organizations date back to the late 1880's. In 1919 RTA was formed as the National Association of Railroad Tie Producers and was renamed the Railway Tie Association in 1932. RTA has been in continuous service to the railroad, timber, and wood preserving industries since then. Can I or my organization join RTA? All Membership applications are subject to review by the RTA's Executive Committee. To see if you may qualify, please view the Membership Categories & Dues. If you decide to apply for membership, fill out the application and submit it for review. You will be informed by return email if your application has been accepted. I'm a member, how do I login? You will have to email us or call 770-460-5553 to obtain your username. Then go to the website to log in and create a password, or click forgot password to reset it. For additional information, see the About the RTA page. Do you have a chart of the RTA organizational makeup? Yes - take a look at the Membership Information page. Does RTA have any information on the sustainability of the wood crosstie? Please see the Railway Tie Association Sustainability Verification Certificate which outlines how RTA members work to ensure sustainability for wood crossties. How many wood crossties are there per mile in the United States on average? How many total crossties does that represent? Approx. 700,000,000-800,000,000 for the US. Approximately how many miles of railroad track are in use by railroads the United States? Approximately how many new wood, concrete, steel and composite ties do the major railroads in the United States use each year? *Note that these statistics are for the major railroads in the United States excluding Canada and Mexico, and exports. These numbers are based on R-1 Reports and survey responses from the Class 1 and Short Line Railroads, and may not accurately represent actual production and purchases of ties. In 2016 the major railroads installed a total of 17,639,190 ties. Smaller railroads installed a total of 3,156,940 ties for a total of 20,796,130 ties used by all US railroads. In 2016 the Short Line and Regional Railroads reported replacing 3,156,940 ties. For a more complete view and forecast of tie use, see our forecasts page, and the market outlook article in Crossties Magazine. How many railroad ties typically constitute a car load? The AAR loading rules stipulate that nor more than ½ of the thickness of the top layer of ties can stick above the top of the car after loading. What is the typical size of mainline railroad ties? Bridge Ties = AREMA Standard is no smaller than 10' long by 8" wide. Where are details about dimensions of ties? Please see an online version of RTA’s Specifications Booklet. How far apart are ties laid? 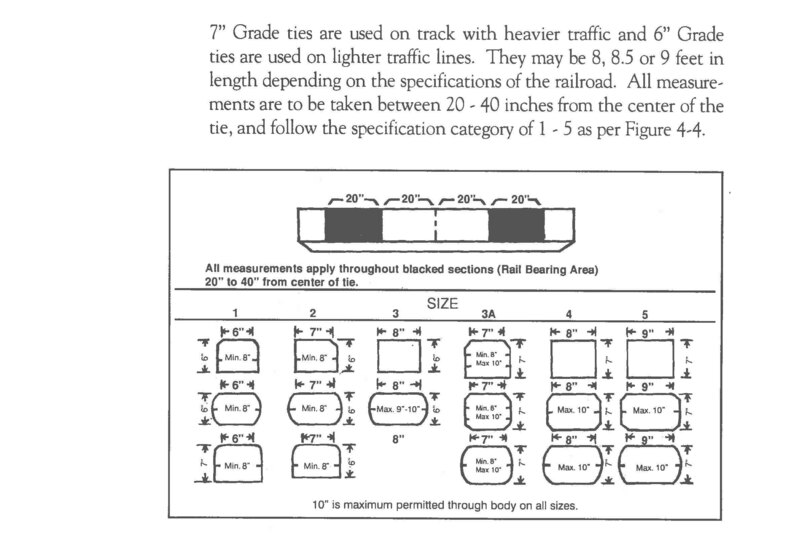 When a grade of a railroad tie is specified, does grade refer to the quality of a tie or its size? See the comparison of grade and industrial grade (IG) ties here. What wood species are used for ties and where did that wood come from? The complete list of allowable species as well as detailed discussions of ties are available in the Tie Guide and the RTA Specifications brochure. Contact end users of the crossties (treating plants and railroads) in your area prior to sawing to determine their current needs. Get the new App available on iPhone and Android with specifications and photos. What percent of the railroad tie market in the United States uses wood ties? Wood maintains a 93%+ share of the market for ties installed in North America. Wood not only has certain desirable performance properties that make it ideal for a wide variety of track applications, but initial and long-term life cycle economics of wood ties is one of the most important reasons that wood is the material of choice for railroad ties. The paper entitled Comparative Crosstie Unit Value and Costs gives more details on the economics of wood compared to alternate materials. What are the other materials used for ties? Other materials used for ties include concrete (about 6.5% market share) and steel or plastic/composite ties (0.5% share or less). How many crossties does the industry produce each year? Currently, the industry has the capacity to produce well over 24 million crossties annually. The greatest production was just over 26 million ties in 2015. Today tie production stands at just over 19 million ties. For the most recent articles on this subject, please see the latest January/February and September/October issues of Crossties in the publications section of Crossties magazine. These articles provide historical and survey data along with annual forecasts of tie usage and demand. How do costs compare between wood and other types of ties? Based on several Zeta-Tech studies, wood ties generally have a lower cost per mile per MGT than any of the alternate tie configurations, except for severe curvature high density applications. Since the advent of dual treatments, wood ties used in wet climate applications now perform similarly to moderate or dry locations as described below and in the linked paper. In general, for moderate density tangent track of the order of 25 MGT per year located in a moderate climate zone of the US, wood tie costs ($/mile/MGT) are of the order of 60 to 80% of concrete tie track; 70 to 75% of plastic (composite) ties, and 80 to 85% of steel tie track costs. For moderate density moderate curvature track (25 MGT per year) located in a moderate climate zone of the US, wood tie costs ($/mile/MGT) are of the order of 65 to 85% of concrete tie track; 70 to 80% of plastic (composite) ties, and 80 to 90% of steel tie track costs. For dry climates, the wood tie costs represent a corresponding smaller percentage of the costs of alternate tie types; for wet climates, they represent a correspondingly higher percentage of the costs of alternate tie types. Click here for information on Comparative Crosstie Unit Value & Costs. Do you disclose the companies that you survey for the monthly purchases report? The reporters are members of RTA and comprise 99.9% of all ties produced in North America. We do not disclose our members’ names to non-member companies. This is not a survey but rather data generated through our monthly member reporting process which is a compliance requirement to be a member. Please note that this report is subject to become subscription based and not available to the general public. Why did RTA change the way it reports Monthly Purchases? Purchases is a calculated data point based on production and changes in inventory. Because members do physical inventory counts that periodically require significant adjustments to their reported data, Monthly Purchases can vary in a manner that is hard for some readers to appreciate. Without a full understanding of this and how members procure and manufacture treated ties that must air-dry for months prior to treating, short term/monthly data points, which could affect investment guidance, is not only imprudent to focus on, but also could lead to unwise analysis of member performance. Thus, RTA made the decision to make the change described in the note* in the Report Tab beginning November 2016 to present the data in a format which suggests using the report’s discussion on the monthly data in a manner that does not emphasize inventory adjustments that may be required following physical counts. *RTA, as of November 2016 onward, uses 3-month moving average for reporting on inventory, affecting calculated values of purchases. In this way, any exaggerations that might be manifest in monthly purchases data, due to regular inventory counts by members, are not emphasized. What is the history of treating wood ties? The crosstie industry began to employ pressure treating as a means of prolonging tie life beginning in the mid-1800s. The first crossties were treated in 1838 with an infusion of bichloride of mercury and laid on the Northern Central railroad in Maryland. The first permanent treating facility began operations in 1848 in Lowell, Massachusetts using alternately bichloride of mercury and chloride of zinc. Tie treatments continue to evolve today with new research and methods. Here is an interesting letter written in 1895 suggesting the use of coal tar (creosote) to prolong the life of ties. Treating wood ties in the US began in earnest in the early part of the 20th century. It took several decades for treating to become universal. In fact, our records show that in the 1940’s approximately 10% of wood ties were still untreated. You may see the history of Class 1 wood crosstie insertions since 1921 here. What types of wood preservatives are used to pressure treat wood crossties? Most hardwood crossties produced in North America today are pressure treated with creosote or creosote solutions. The US Environmental Protection Agency (EPA) has approved and registered creosote for this industrial application. Other approved standardized preservatives include Ammoniacal Copper Zinc Arsenate (ACZA) Copper Naphthenate (CuN) and Pentachlorophenol although Penta has not been used by railroads in decades. Some producers also use a dual treatment system where ties are treated with borate compounds prior to a second treatment with creosote. The borates diffuse throughout the hard-to-treat heartwood of many species and provide additional protection for wood used in high decay areas. In January 2010, the AWPA approved the use of ACZA as an accepted wood preservative for ties. For example, Douglas fir is a strong, plentiful species, well-suited for use as ties, but not readily treatable with standard preservatives. Tests of ACZA-treated Douglas fir ties have shown low corrosivity and excellent spike-holding characteristics. ACZA enables wood to resist termite damage and fungal decay and has been found to reduce flame spread in wood timbers. How far does creosote penetrate? Some species treat nearly 100% while in others only the sapwood treats easily. In refractory (hard to treat) species, many railroads use borates in a dual treatment process to provide protection to the heartwood. What are the other approved treatments for hardwood ties? 98% of all wood crossties produced in the US and Canada are treated with creosote or creosote and oil blends. In addition to creosote, Pentachlorophenol and Copper Naphthenate (CuN) are approved preservatives for hardwood ties by the American Wood Protection Association (AWPA). ACZA is now also approved for Douglas fir and hardwood ties. CCA (copper chrome arsenate) is not recommended for hardwoods but may be sometimes used for certain Southern Yellow Pine timbers and ties. Generally, CuN is applied with lighter oil carriers than creosote that may not provide the same extent of weather-proofing properties as the heavier creosotes. CuN is applied with oils that have lower flash points than creosote, some typical processing steps used when treating with creosote alone (sterilizing the ties under high heat to condition the wood and eliminate decay fungi that may have begun to grow while the wood is air-drying prior to processing) cannot be done. It is expected that CuN would be most effective in hardwood ties when used in high decay hazard areas if the ties were dual-treated with a borate pre-treatment. Mississippi State University has conducted studies on dual treatment with CuN which you can find here. Nisus Corporation has assumed the EPA registration for CuN and built a new manufacturing facility in Knoxville, TN, which will fuel more widespread use of CuN. At least five treating companies now offer ties or timbers treated with CuN for railroad use. Borate compounds are now used in dual treatment processes for roughly 7 to 7.5 million of the 22+ million or so ties produced per year. Over the years of testing (50+ documented years now for creosote - see the 1958 cooperative study) creosote has proven to be the most efficacious and cost effective wood preservative for hardwood ties. It has significant weatherproofing properties and is an excellent preservative for hardwood species. However, some wood species are refractory (hard-to-treat) and the heartwoods of those species are almost impenetrable by any wood preservative with the exception of borate compounds which diffuse through the wood over time. Thus, for these refractory species destined for high decay areas, it has now become relatively common practice to use borates as a pre-treatment to protect the wood prior to processing with creosote. Borate dual-treatment protects the entire cross-section of the wood tie providing excellent service life even in high biological-hazard service conditions. Each preservative system has its place in the wide variety of railroad applications and climactic conditions in North America. RTA is continually researching and testing other systems, but not one is in use other than those mentioned here. What is RTA doing to research alternate preservatives? RTA is working in conjunction with AAR to determine the relative effectiveness of alternative tie treatments with the ongoing Alternative Wood Protection Research Project (AWPRP) at Mississippi State University. The objectives of the project include determining the relative biological durability to decay fungi and subterranean termites of crossties commercially treated with existing and alternative preservatives exposed side-by-side in a replicated test on a site in AWPA Hazard zones 4 and 5, to determine the effectiveness of treatments against Formosan termites, to determine the corrosivity of alternative preservatives, and to determine the tie dimension stability effects of alternative treatments. How can I contact manufacturers of pressure treated wood crossties? Access to the full RTA membership directory is available only to members of the association. You may access the digital edition here. You may apply for membership and, if accepted, you will be able to access the full directory online. If you are not eligible for membership, RTA staff will attempt to facilitate members contacting you. You can send an email to us and we will forward it to appropriate contacts. Please make your inquiries as specific as possible and include full contact information including your name, your company name, and phone, email and physical address information. These inquiries should be of a serious business nature and will only be forwarded if the intent of the inquiry will further the goals and business interests of our membership. Are treatment facilities clustered in certain regions of the US? Approximately 46 North American treating plants are geographically located near the hardwood resource and accessible to the major railroads by rail. This necessarily means that a vast majority are east of Dallas and south of the Great Lakes. There are a few commercially important plants north and west of this area. Is there any information about worker exposure to creosote-treated ties? In conjunction with the Creosote Council and the Railway Tie Association, AAR met with EPA on September 26, 2003 as part of the re-registration process for creosote. The key point is that railroad workers do not manually handle crossties. Virtually all crossties are handled and installed by mechanized equipment. Workers who do come into contact with creosote treated crossties are required to wear long sleeve shirts and gloves to protect them from exposure. You may get further information at the Creosote Council's website. Do ties need to be treated differently in different areas of the US? When incising is specified, the material shall be incised prior to yarding and seasoning to reduce checking, or if dry prior to treatment on four sides, with incisor not more than 7/32 inch thick to the pattern shown in the figure below. In pieces 5 inches or more thick, the incisions shall be 3/4 inch deep. In pieces less than 5 inches but more than 2 inches thick, they shall be 3/4 inch deep in the edges but only 1/2 inch deep in the sides. Incising of pieces 2 inches and thinner is not recommended. Patterns slightly different are not objectionable if machines constructed prior to 1940 are used. What is the annual replacement rate of crossties in the United States for the last ten years? 3.0%. This translates to an average life in track of between 33 and 42 years. How big is the market for recycling and utilization of used ties. USA and Canada? Approximately 20-22 million wood ties are replaced each year in these countries. A majority are already recycled as landscape ties or disposed of as fuel in co-generation facilities. The number that may be disposed of in approved landfills is not known accurately, but may be as many as 3- 4 million. More details are available in our 2015 Wood Crossties Disposal Survey. How are wood crossties disposed after their useful life in track? Wood crossties have many recycling and disposal options. The best source of information are these two publications Management of Used Treated Wood Products and its companion Addendum For the Western United States. 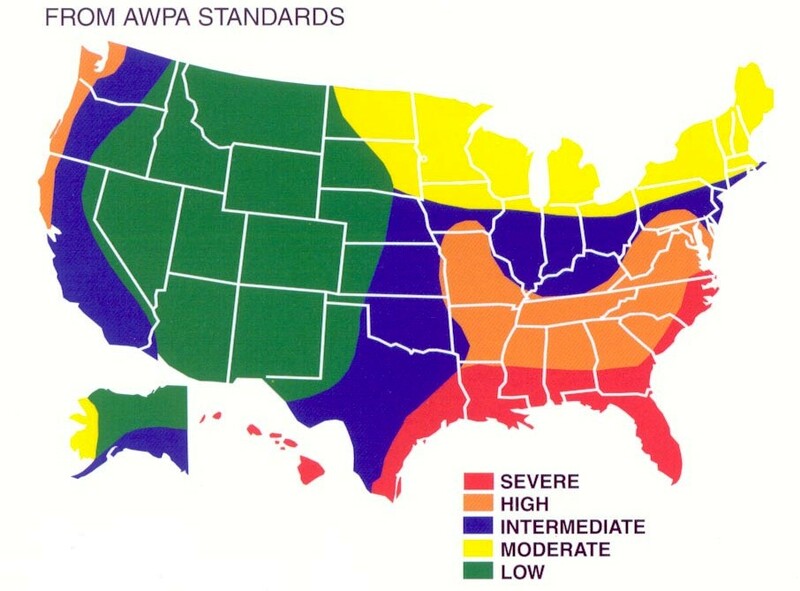 Please note that California and other western states have additional requirements under certain circumstances and you can consult the Western Wood Preservers Institute for the most up-to-date information. Crossties are also used for landscaping timbers and a significant quantity are burned in approved co-generation plants to produce electricity and gas. Biochar, a carbon soil additive, is another sustainable use for used crossties. More information on this is available under the heading Why Wood Crossties? You can find additional information on topics such as the safe disposal of used crossties and special regulations under Environmental Literature. How do I know if a landfill requires a special permit for used tie disposal? Landfill rules for ties vary from very restrictive to very loose. It is a state-by-state and often a county-by-county determination/rule-making process. Some states are so restrictive that you must perform a TCLP chemical analysis of the ties, plus provide a chain of ownership manifest before landfilling, and in other states/counties ties can be disposed very easily in non-lined C&D landfills. A few locales require cutting ties to 4’ before accepting them. The only way to know for certain is to contact the landfill in question and ask them their requirements. Please note that if you run across a landfill that says ties are a hazardous material, that is incorrect (although you may have to prove it with a TCLP test). If that specific landfill is in a state that does not require TCLP tests, you may want to alert us so we can provide follow-up. What types of tie data are available for parties interested in using ties for cogeneration facilities? Average weight if landscape ties are put in with fuel ties 159 lbs per 7x9-8'6"
What regulations govern the burning of railroad ties for fuel? use in combustion units effective March 9th, 2016. See the complete final rule in the Federal Register here. The rule for creosote/borate and copper napthenate/borate ties has also been changed and appeared in the Feb 7th 2018 Federal Register here. Is it safe to burn treated ties? Burning creosote wood in EPA approved facilities has been done for many years and is a widely accepted practice. RTA does not have a publication speaking to the details of what kind of requirements there are for specific facilities to be approved since the permitting practice varies from state to state, at least in the US.An update on the EPA Solid Waste Rule from 1-13-15 for information only can be found here. Could you put me into contact with organizations or companies that deal in environmentally friendly treated crosstie disposal? Our digital directory lists basic contact information for our member companies. Where can I buy scrap hardwood from a sawmill? It would be perfect for our wood stove. Thank you for your interest in scrap hardwood. Unfortunately, we are unable to suggest any mills that might sell scrap since most sawmills that cut railroad ties either use the scrap as fuel to run their equipment, turn it into wood pellets for other uses, or offer the scrap pieces to people in their local area. What are the nails with letters and numbers on them you can find around railroad tracks and in some ties? They are called date nails. See this informative article for more information. I came across some old ties that are currently being used as fence posts. They all have S-shaped bands hammered into the both ends of the tie. Do you know what these are called and what they are used for? The S shaped bands are called S-Irons and were once applied to ties to minimize end splitting. Some are still in track today, but railroads now use gang-nail style end-plates to control end splitting. What about white ash that is infested with the Emerald Ash Borer that has spread to OH, IN, IL PA and looks like it will go further? Ash is an appropriate species for ties. However, it seems that the EAB may be with us for some time. The best preventative is to minimize transport distances of the raw logs with bark still intact. To transfer any Ash product (logs, crossties, lumber, chips or bark mulch) out of an infested county, you must have the proper paperwork and inspections from the USDA. It is best to have the raw logs processed into ties or lumber as close to the source as possible. For updated information see the Emerald Ash Borer Information Website. Where can I find more information and maybe a map of railroads in the US? The Association of American Railroads and the American Short Line and Regional Railroad Association both have a wealth of information. You can check for a map of the Class 1 railroads by name and the Short Lines in general here. How can I learn more about wood crossties? The best resource for learning about wood crossties is The TieGuide. This comprehensive document can be viewed online, and is also is available for download and/or purchase. It contains information on tie specifications, wood preserving, species properties, and much more. A limited number of free copies are available each year for classroom instruction in secondary school and college and university programs. Contact the RTA staff at [email protected] for more information. The Tie Guide ya esta disponible en español. Tie spacing is not amenable to walking, is this intentional to keep people off the tracks? The spacing between ties is optimal from an engineering and maintenance standpoint. The fact that it makes walking uncomfortable is just a bonus as walking on railroad tracks is both illegal and dangerous. Please look at this information from Operation Life Saver and remember that injury and death from trespassing on railroad tracks is preventable.